Tens of thousands of anti-war protestors gather on the grounds of the Washington Monument to voice their opposition to the possible oncoming war with Iraq. 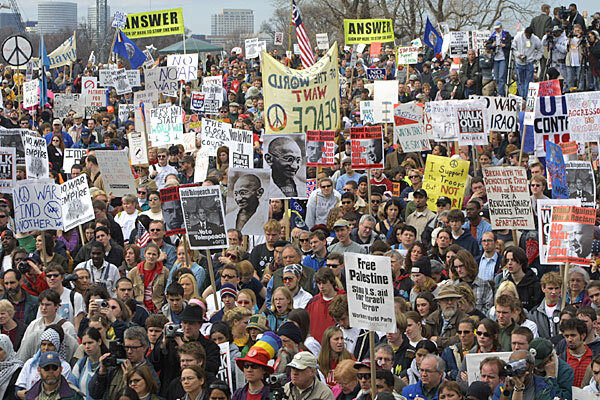 March 15, 2003 - Tens of thousands of anti-war protestors gather on the grounds of the Washington Monument to voice their opposition to the possible oncoming war with Iraq. Organizers of today's rally fear this will be their last attempt to make their voices heard before the United States does take military action to disarm Saddam Hussein. Official estimates by the Washington, D.C. police put the total attendance of the protest at 40,000, but protest organizers dispute that number and estimate 100,000 showed up to oppose the war.